In this blog I hope you will find enjoyment on my journey's through the back woods and roads of Northern Iredell,Yadkin, Alexander, and Wilkes counties as we look at rare and unique specimens of our native trees,plants and wildflowers. We will also look at how non native invasive intruders are are effecting our native flora. Growing up in North Carolina late summer was always one of my favorite times of the year. I looked forward to going back to school and seeing many friends I had not seen all summer, and it was time for our native Muscadine grapes to ripen. We didn't have cultivated grape vines at my families nursery, the native Muscadine vines grew all around the edges of the woods climbing up trees and neighboring old buildings. Not only did I look forward in picking and eating them fresh, I was always trying to convince my Mother or Grandmother to make Muscadine jelly from my pickings. Vitis rotundafolia the Muscadine grape is native throughout the Southeast to Texas. The oldest cultivated variety of Muscadine grape is the "Scuppernong". Scuppernong is a yellow bronze sometime called white type of Muscadine grape. 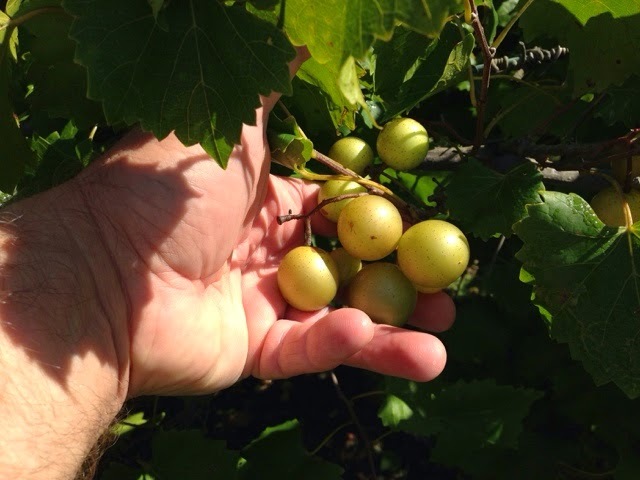 The Scuppernong was first mentioned as a white grape in a written log book by the Florentine explorer Giovanni de Vezazzano while exploring the Cape Fear River in 1524. The Scuppernong grape actually got it's name from the Scuppernong river which runs from Washinton county to the Albemarle sound. The name Scuppernong actually comes from the Algonguin Indian word "Acsepo" meaning Sweet Bay Tree. Stories tell us that the Scuppernong grape was first cultivated in Tyrell county NC before 1760. Other stories tell of a "Mother" vine on Roanoke Island that was over 400 years old. The North Carolina general assembly designated the Scuppernong grape the official state fruit in 2001. Here in northern Iredell county if you look you can find the purple or black Muscadine grape growing wild in close proximity to the bronze or gold Scuppernong type. North Carolina has been hit hard not only by the recent recession but earlier in loss of tobacco, textile and furniture jobs leaving for overseas. The one thing that has came to the rescue is vineyards and wineries. There are now more than 100 wineries and 400 vineyards across the state. There are 36 wineries and vineyards in the Yadkin Valley region alone .This has brought badly needed tourism and jobs to this area. And while some of the grapes grown at these wineries and vineyards are not our native grapes, much of the credit goes to our native Muscadine and Scuppernong grapes. They have brought new life for old living across North Carolina and the historic Yadkin Valley. My journey as a plantsman and a nurseryman has taken many turns over the years. Most may not understand this next statement but most of the plants I grow I did not choose but rather they chose me. Many times I have ended up coming home with cuttings or seed of something completely different than what I intended and I still grow some of them to this day. The mention of Cactus can cause some to think of vampires, misery, pain even alien abductions. I have heard countless stories from people that fell into or onto a Cactus from a window, bicycle or while hiking the Grand Canyon. I have met and corresponded with many wonderful people all over the United States even the world that I never would have if I did not have the desire to grow and offer these interesting plants. I am growing several species from across the United States that are cold hardy for our winters in North Carolina. 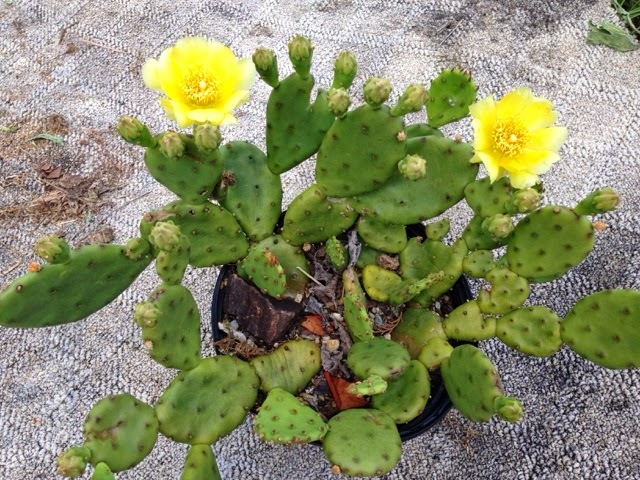 But our most common native Cactus of the eastern USA Opuntia humifusa or Eastern prickly pear or Devils tongue is a very good landscape plant.And it is not quiet as fierce as it's sisters. Cactus are remarkable plants, alien in most respects to other flora. They have adapted to dry places, some with varying temperatures from winter to summer. Eastern prickly pear can be found growing on south to western facing slopes on rocky, sandy soils that drain quickly, it rarely reaches a foot high but can reach three feet wide and ancient plants can grow to wider widths. In the absence of leaves enlarged stems called pads carry out photosynthesis . Cactus has replaced leaves with sharpe spins and have small barbs called glochids. Eastern prickly pear does not have as many spines as most of its kin sometimes almost none but do have glochids. Sometimes the smaller things in life are the worst! 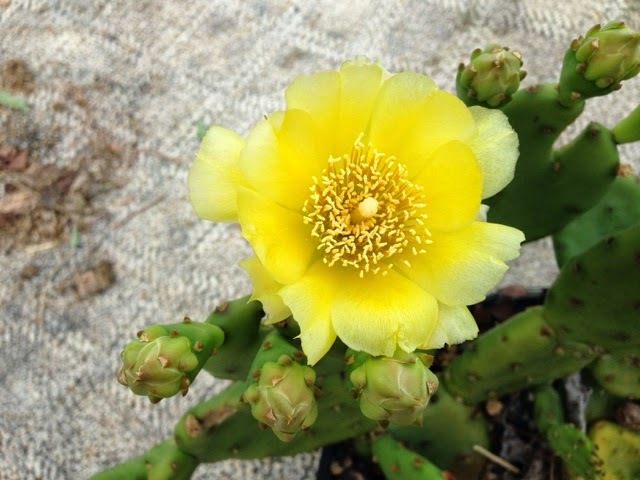 Eastern prickly pear has beautiful yellow blooms sometimes with red centers that produce juicy edible fruit once they have been debarbed. The flesh of the fruit can be made into syrup or jelly even candy. The pads or stems are edible also. 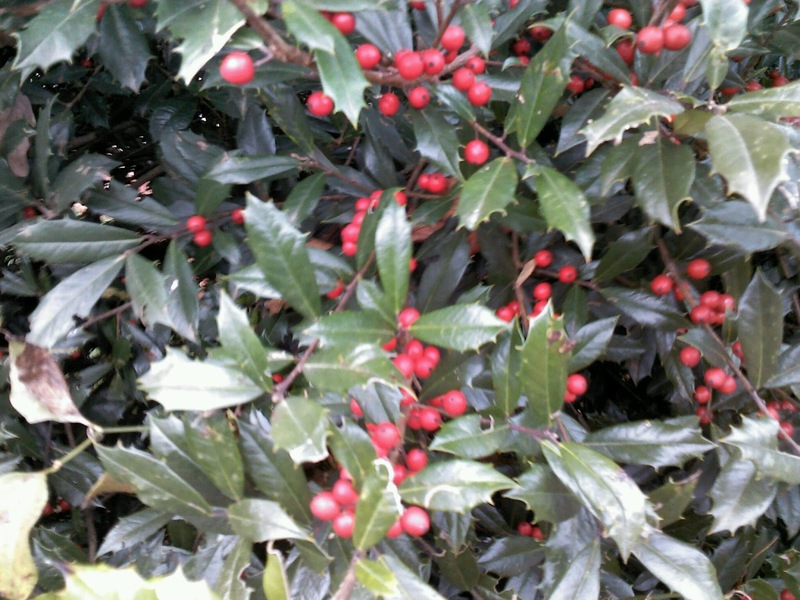 Native Americans had many uses for the plant as a food and as a medicine . Eastern prickly pear can be used as a ground cover and makes an excellent container plant. They could even be used in a hanging basket. Some specimens pads turn a very attractive reddish winter color when cold weather comes. They are never boring. They prefer well drained soils and a more neutral ph than most of our native plants . They need low nitrogen fertilizers with higher rates of phosphate and potash. Eastern prickly pear is native to almost every eastern state to Montana and even parts of Canada. Some can survive winter temps well below zero F. Just remember the drainage. This is an easy plant to grow and will thrive if you remember a few rules, mainly don't plant it in shade or a mud hole . You can leave on vacation for several days your prickly pear will be there when you return, while your hosta will be dried up or has ended up as deer chow. In recent times with our dubious economy many people are interested in returning to growing and producing things themselves that they can eat. Fruits and vegetables growing has increased with home and landowners whether they have 40 acres or just a half acre. Fruit and vegetables must be pollinated so many have also taken up bee keeping for the pollinators and the benefit of the honey also. Honey bees are having their problems and we have no clear solution in site. I was set up selling my plants and trees at one of our local farmers markets last year suggesting to a gentleman he might like to plant one of my Swamp White Oak trees, he said " Im not planting anything I can't eat". Well, he caught me at the wrong time! Now I fully support growing and doing any thing in the dirt that will produce food for you or anyone else period. But saying that a tree is not important to your well being because it does not directly feed you is bad judgment. First of all Oaks are a cornerstone species to life. Over 5000 species of insects, 58 species of reptiles, 105 species of mammals and 150 species of birds rely on Oaks for their life cycles. Of that 5000 species of insects many of them are pollinators such as butterflies. Which by their pollination of the flowers on your vegetable and fruit plants WILL feed you and your family. 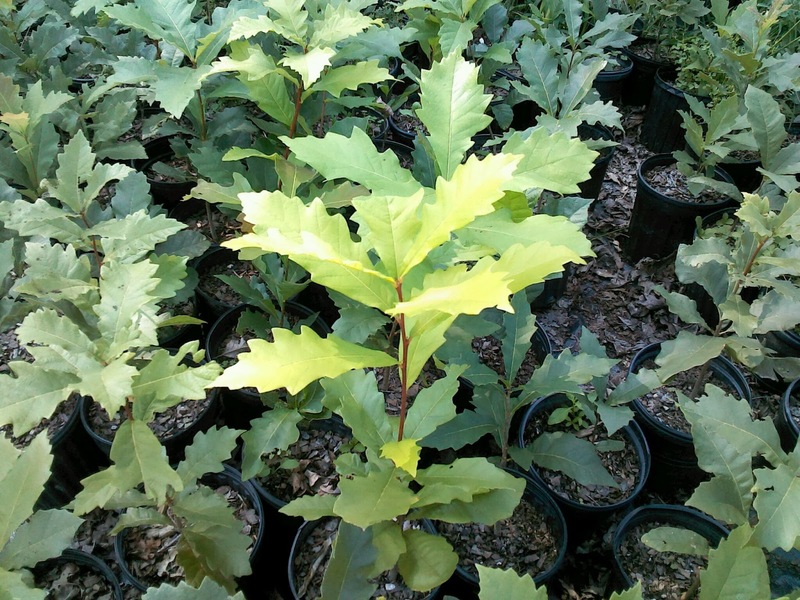 Oaks also produce shade, help with water runoff and soil conservation, are valuable for lumber, leaves are valuable for mulch, acorns can be used to feed livestock. Just because something doesn't look like a food source look again. It might be a big key in our very survival. Winter after the holiday season is over can be a long, dismal and depressing time of year for some depending on where you live and how severe of a winter you have. Winter can be an eye opening time of discovery, opening up views that are blocked that we do not see or notice in the other seasons of the year. The bark of our trees can offer special characteristics that may be hidden from plain view except in winter. Platanus occidentalis our American Sycamore is one of our showiest native trees when it comes to bark. Most Sycamores only have a good showing of bark on the upper portion of the tree, this blocks the view except in the months that foliage is in the way. 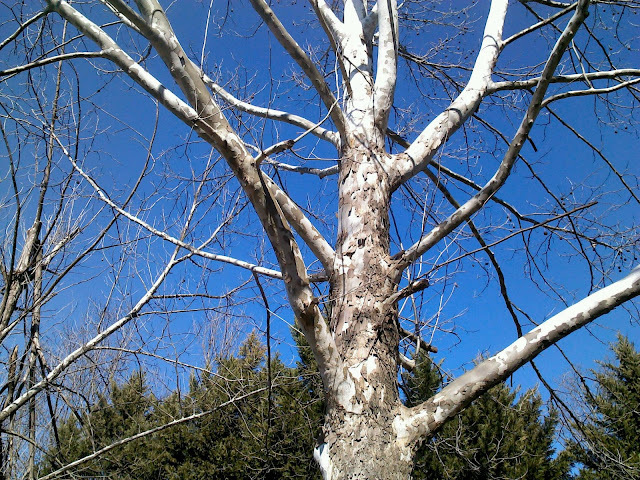 American Sycamore is one of our fastest growing and largest growing trees in the eastern United States . It is also tolerant of some soil compaction and periodic flooding. Winter is when its glory shines. Brighten your winter days and go locate a Sycamore, it will lift your spirits. As the holiday season is upon us we are searching for gift ideas. This is my pulpit so I am putting forth my two cents worth to whoever reads it. Gardening and landscaping are more important than ever and I have seen a decrease in the rural areas in my state of people who do either. It does not hurt anyone to grow something they can eat, whether it be vegetables, blueberries or something else they can partake of the fruit of eventually. There are many ways someone can garden even on a deck, porch or roof in containers. Many products for growing in containers have been produced and can be bought at your local nursery or garden center. And for those who have room there has never been a more important time to plant trees. Whether you want to argue global warming or not trees produce oxygen that we breathe! They help clean our air. Planted in the proper place depending on the species they provide shade to help with summer cooling costs, they can prevent water run off. They provide food and shelter for birds and countless wildlife. They produce beauty through blooms, foliage and even bark for years. When giving this year consider giving plants, trees or garden seed. I guarantee as the years go by the receiver will never forget who gave them the tree or plant that they have enjoyed for years. Many nurseries offer gift certificates as well. Support your local nurseries and garden centers in the off season, especially the ones who actually grow the plants. You can use their knowledge for years to come. What is that worth. Sometimes a common name does not give proper respect to the plant that is tagged with it, other times it shows its hardiness. Many plant Maples for shade trees and that is fine, but we really need to be planting Oaks. There are around 600 species of Oaks in the world. They are a keysetone species in every habitat they are present. Many types and species of wildlife depend on Oaks to survive. White Oak lumber has played a very important part in this nations growth and progress from ship building, barrels, furniture the list goes on.. In the southeast if you visit a nursery or garden center you will not find a large selection of Oak species to pick from. Usually you may only find one or two at best. Willow Oak, Quercus phellos has been the most popular species to plant as a shade tree. It is fast growing and transplants fairly easy. The latter is a problem with many Oak species including White Oak, Quercus Alba. Willow Oak is anchored to the ground very well. But, the small narrow leaves are very hard to clean up. Their shape and size enable them to get into every conceivable crack and crevice on a property. Larger leaves would be a plus. Also cold hardiness limits the range of Willow Oak colder than zone 6. I started evaluating all Oak species that were native in my area of North Carolina that I would feel very comfortable growing in the nursery and offering to the public, none quiet fit what I was looking for. Then I discovered Quercus bicolor, Swamp white oak. Swamp white oak is mainly a tree of the the northeastern and midwestern states. There are small scattered populations in Virginia, the Carolinas and Georgia. In North Carolina they are found in the central and northeastern counties, also listed in Guilford and Davie County. It is a very fast growing tree that has a great root system enabling it to tolerate wet mucky and compacted soils with occasional flooding, as well as drought conditions. It is recommended for planting far past its native range even into Colorado, by cities where it rains far less than in most of its native habitat. Its limb structure can handle wind, snow and ice perhaps better than any other Oak. As a wildlife tree its acorns are preferred above many. They were a favorite of Iroquois native Americans for their sweet taste. As an ornamental tree it is not a slouch. It is very fast growing. The bicolor in its botanical name refers to the white undersides of the foliage which help elevate its appeal. The trees canopy is outstanding. 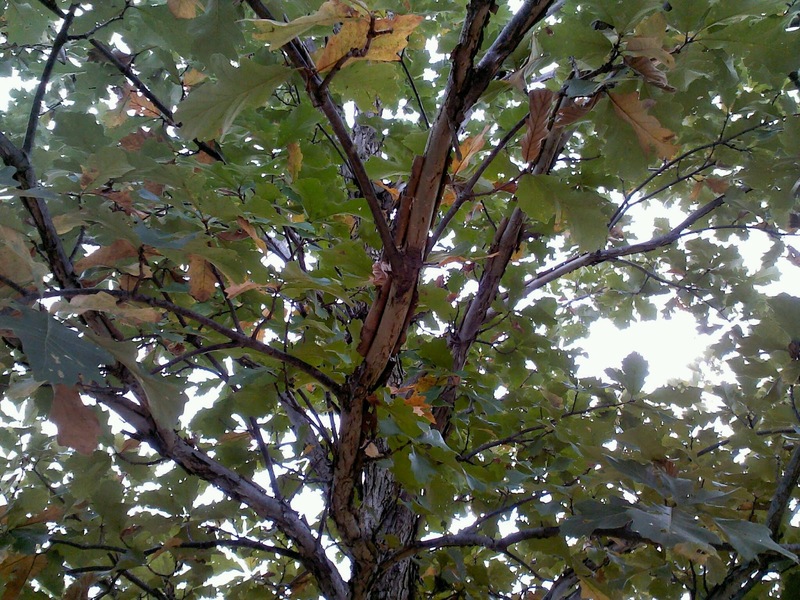 The bark is more scaly than regular white oak and a bit darker. Its younger limbs have peeling bark similar to a birch. The fall color can range from yellow to tan, to red. In my seedlings I have seen all the above. Perhaps the greatest compliment thay can be given a tree is where someone plants it. Swamp white oaks, over 400 of them in all were selected and planted at the World Trade Center memorial at ground zero in New York City. They are the only thing that has been planted at the memorial besides one surviving Callery Pear. That is a story in itself. I dont know what you may think but I do not believe they would choose a trash tree or a weak tree for that site. In choosing shade trees to plant with beauty and strength, capable of living 300 years or more, choose wisely, choose Swamp white.oak, Quercus bicolor. I am often talking to a customer at our booth at a market or at the nursery who may be browsing at some of our small trees when they say, "Its no use for me to plant one of those, I would never live long enough to see it get very large". I have heard that more than once and it really has gotten to the point it angers me. First thinking you will die before you would ever be able to enjoy something is not very positive thinking. Second it is very selfish to think of planting a tree where you are the only one to benefit from it. That selfishness really describes many things about our society of recent years, "I want mine, the rest of you be"damned". Long before humans walked the earth trees were growing. Ginkgo biloba fossils can be found in the fossil record for millions of years. While now it has no close relatives and is only native to China, fossils have been found in North Carolina in such places as the Solite Quarry on the North Carolina-Virginia border. The trees are capable of living for hundreds even a few thousand years. It's branches have almost perfect symmetry. It has a good central leader naturally. The leathery parasol shaped leaves turn a beautiful yellow color in the fall. Most years all leaves drop all at once. The trees are very durable of coure having been on the earth as long as they have. And once they get established and reach head high they bolt to the sky. 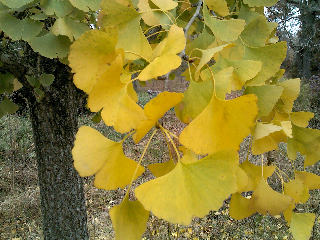 Ginkgo has in recent years became popular in herbal supplements to treat illnesses such as Alzheimers. As humans while we cannot control what nature does, we still must continue living. And someone will come after us. I hope those who follow dont look back at us and think of us as the lazy predecessors that would not take five minutes of our lives to plant something they could enjoy with reverence. Plant a tree, you will enjoy it also. And I suppose with millions of years of fossils as evidence, Ginkgo qualifies as native under the "Grandfather" clause. I am the father of two daughters ages 18 and 15. I have worked and enjoyed horticulture my entire life and plan to do so the rest of it.